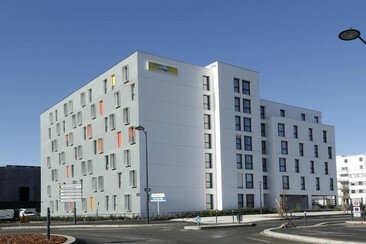 Located in a quiet and green area north of Rennes, close to the city centre, amenities and the ring road that serves the main routes from key areas (St Malo, Dinard, Nantes, Expo Park, Airport), Appart-Hotel Appart'City Rennes Beauregard offers self-catering accommodation, a lift and free internet. All 108 apartments are furnished and equipped with a kitchen with hob, microwave, coffee maker or kettle and fridge. The Campanile Rennes Centre is an ideal base for exploring the charms of the historic city centre of Rennes and the local area. This property is close to the SNCF railway station and bus station, as well as must-see tourist destinations such as Mont Saint Michel, Saint Malo and the Pink Granite Coast. 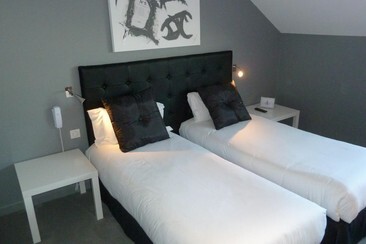 The 3-star hotel has 64 comfortable rooms with new bedding and duvets, complimentary tray with kettle, tea, coffe. We make every effort to ensure that your stay in Rennes is relaxing and comfortable, whether you are holidaying with your family, taking a weekend break or travelling on business. The hotel offers an all-you-can-eat buffet breakfast with a surcharge. Free WIFI in all rooms. Hôtel Astrid is located less than 50 meters from the train and subway station, 10 minutes from the historical centre of Rennes and the Colombia shopping centre. It offers soundproofed accommodation equipped with a flat-screen TV. Rooms at the Astrid are serviced by a lift, and have a private bathroom. They each have free Wi-Fi access. The hotel has been entirely refurbished over the last few years and is proud to invite you to discover its 30 fully furnished rooms.